Throughout much of the historic period the Pawnee inhabited the territory centered in the valleys of the Loup and Platte rivers and along the Republican River in what is now the state of Nebraska in the central United States. The Region of the Loup, Platte, and Republican rivers consists largely of high and dry grass-covered plains interrupted by rivers and river valleys and is characterized by a sub humid climate. Trees are nearly absent except along the river courses. The Pawnees were farming people. Pawnee women raised crops of corn, beans, squash, and sunflowers. The men worked together to hunt buffalo and antelopes. Originally, Pawnee hunters would drive buffalo onto marshy land where it was easier to shoot them, but once they acquired horses, they hunted buffalo from horseback. 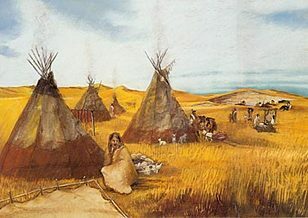 Most Pawnee Indians lived in settled villages of round earthen lodges. Pawnee lodges were made from wooden frames covered with packed earth. When the Pawnee tribe went on hunting trips, they used buffalo-hide tipis (or teepees) as temporary shelter, similar to camping tents. Pawnee women wore deerskin skirts and poncho-like blouses. Pawnee men wore breechcloths and leather leggings. Men did not usually wear shirts, but warriors sometimes wore special buckskin war shirts. The Pawnees wore moccasins on their feet, and in cold weather, they wore long buffalo-hide robes. A Pawnee lady's dress or warrior's shirt was fringed and often decorated with beadwork and painted designs. Pawnee hunters used bows and arrows. In war, Pawnee men fired their bows or fought with war clubs and spears. The Pawnee are known for their beautiful pottery, hide paintings, and woven baskets. The rituals and ceremonies of the Pawnee tribe and many other Plains Native Indians, included the Sweat Lodge ceremony, the Vision Quest and the Sun Dance Ceremony. The sacred, ceremonial pipe (called a Calumet), was ritually filled with tobacco was passed among participants at all sacred ceremonies of the Pawnee. When they traveled over land, the Pawnees used dogs pulling travois (a kind of drag sled) to help them carry their belongings.